An all-year-round pod for the whole family. We often see how a MOSSpod becomes the hub of a household (even when it’s in the garden!) and this was certainly what happened for a Bristol client after we installed a Park Range garden office and a bespoke shed. 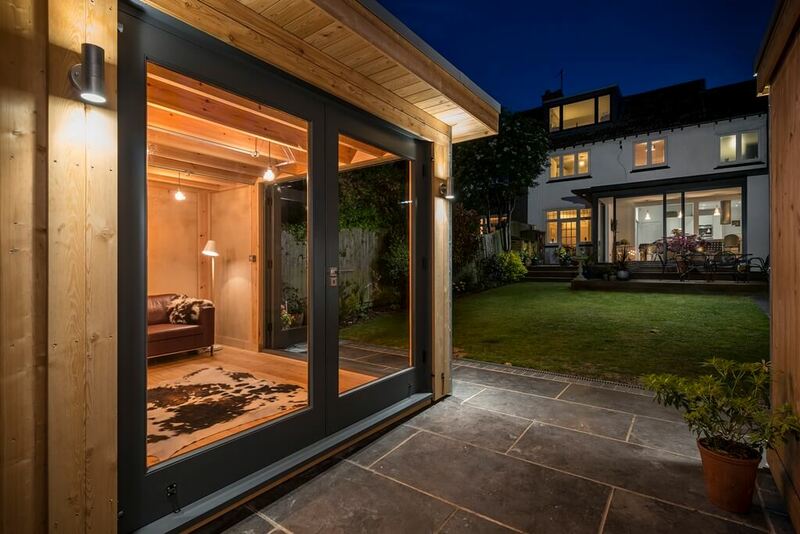 Phil’s garden room is the perfect example of how the pods can be used all year round and it really shows how adaptable they are: it can be whatever you want it to be…any day of the year! His initial plan for the pod was to create a new office space: after winding down from corporate London life, he found himself increasingly working out of the spare bedroom and becoming frustrated with this set-up. The bottom of the garden seemed like an ideal location for a new home office but it was neglected and unusable in its current state with several overgrown conifers and an old disintegrating shed and wendy house. After seeing an advert for MOSS in the Cotswold Life Magazine, Phil got in touch. 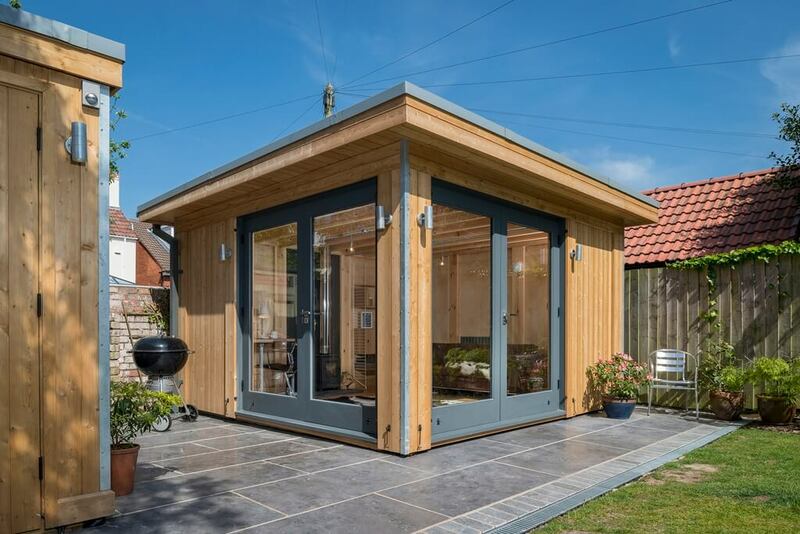 A simple design meeting gave him the confidence to go ahead with a luxury garden office and as we would be removing his old shed, we also designed an outbuilding to ensure the gardening equipment still had a home. 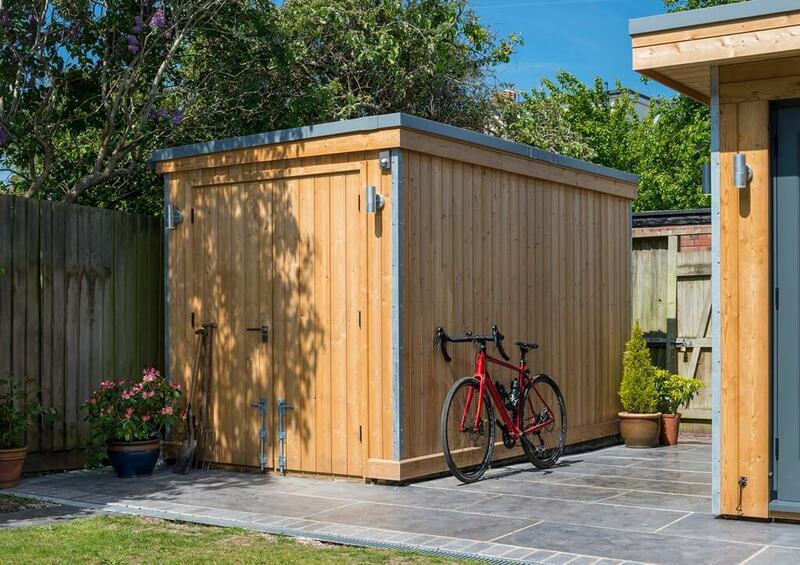 This is often the case when we’re installing garden rooms and we have designed several solutions to make sure that this essential storage isn’t lost. The MOSSpod, as in most cases, fell under permitted development at the bottom of the garden and therefore no planning permission was required. It meant we could programme the build in within weeks of ordering. One of Phil’s main criteria was that he ‘didn’t want to compromise on design or comfort’, and was pleased to find that ‘the finished pod has exceeded expectations’, which we’re delighted about! 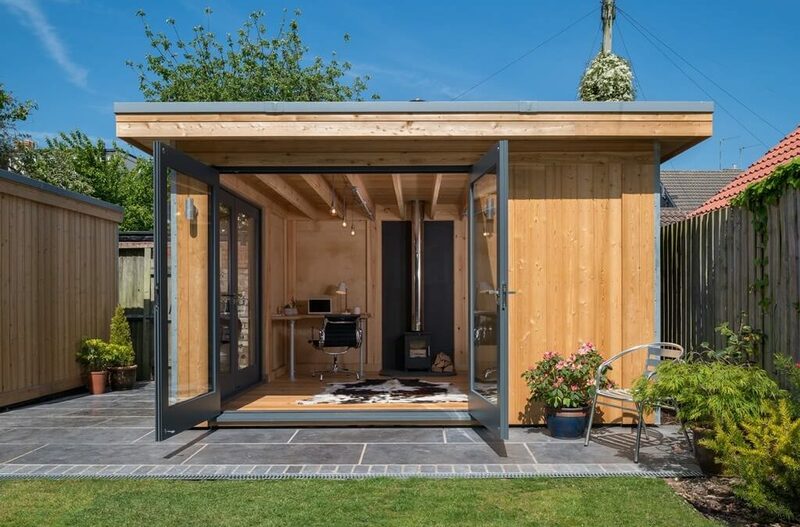 Our classic silver larch offsets the dark grey window frames, with galvanised steel detailing on both the pod and the shed, linking them stylistically. 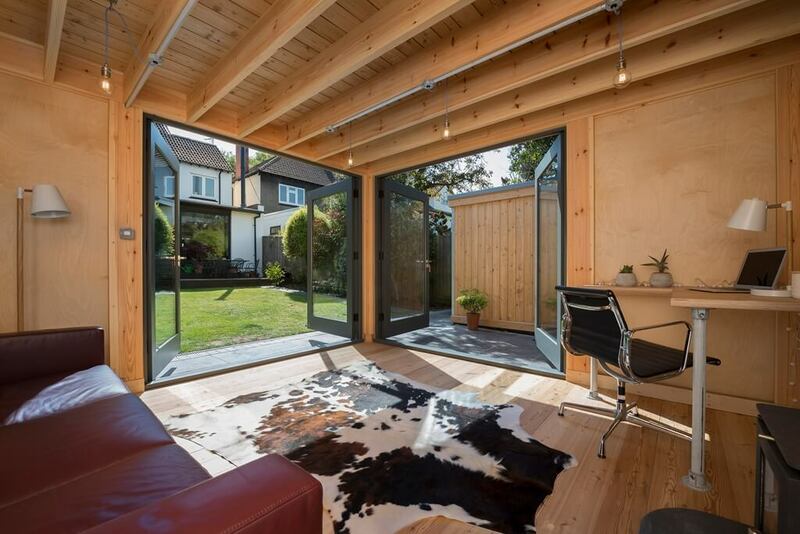 Following the installation of the home office and shed we designed and installed simple landscaping to finish the pod off and give access from the house to the garden room. We paved the area with gorgeous light grey granite paving, chosen by Phil, which makes a neat and contemporary finish. 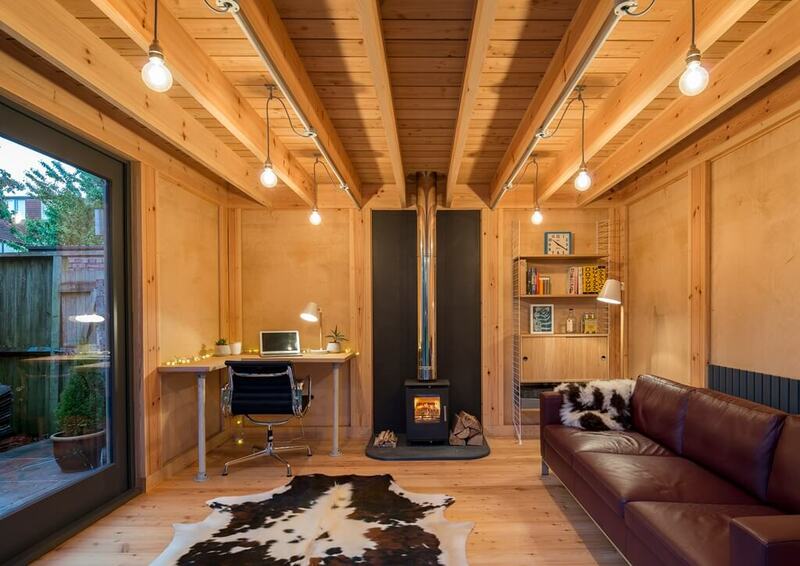 Internal fixtures and fittings are equally stylish with decorative filament light bulbs left bare on cord to line the redwood ceiling beams, creating a warm light in the pod, while the luxury wood burner keeps the room cosy in the winter. The simple birch ply lined walls glow in the light of the fire and ooze a ‘hygge’ Scandinavian feel. Almost as soon as the pod was finished, Phil decided to take early retirement so the home office has actually become a garden room for the whole family to enjoy. They use it every single day throughout the year, come rain or shine. On a visit from MOSS last winter, he had the wood burner glowing with the doors flung open to the crisp, chilly air – what a way to relax! When all the doors are open, this pod just feels like an extension of the house, stretching to the bottom of the garden – and that’s exactly how it’s used – as a central family hub, which is perfect as their family has grown. We are also now working on several other jobs as part of their house renovations, showing the wonderful trust we have developed.